(formerly Houston Metro Airlines and NASA Commuter Air Lines) (FY/MTR) (Houston - Bush Intercontinental) 1973 - 1984 (continued until 1993 under the American brand). Photos. Framable Color Prints and Posters. Digital Sharp Images. Aviation Gifts. Slide Shows. 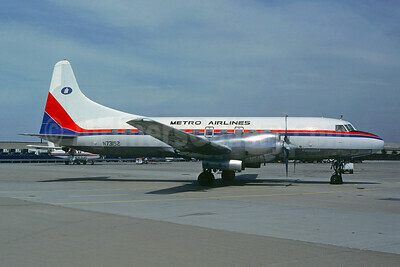 Metro Airlines Convair 580 N73152 (msn 170) DFW (Christian Volpati Collection). Image: 941668.